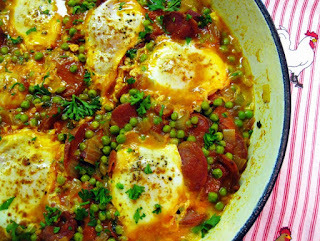 Eggs with Peas and Chourico "Ovos com Ervilhas e Chourico"
Portuguese cuisine is full of comforting dishes and this is one of my favourites. A one pot wonder that will fill your belly and soothe your soul. 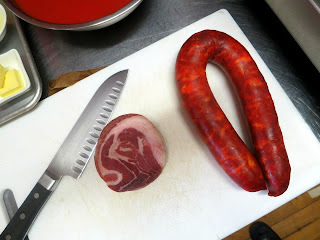 Chourico is a Portuguese cured pork sausage. If you can’t find it, you can substitute it with Spanish chorizo but it won’t be as authentic. Serve this dish with crusty bread and some white wine. Enjoy! 1. In a large skillet over medium high heat, add oil and butter and heat for 30 seconds. Add chourico and pancetta and cook until browned and edges are crispy. Remove the chourico and pancetta from the skillet with a slotted spoon and reserve. 2. To the skillet, add onions and reduce the heat to medium. Cook the onions for 5 minutes or until they are softened and browned. Add garlic and cook for 2 minutes. Add wine and deglaze the pan. Cook until the wine has reduced by half. 3. Add tomatoes, lemon juice and bay leaves. Increase heat to medium high and bring to a boil, then reduce heat to a simmer. Add 1/2 of the parsley (reserve the rest for garnish) and red pepper flakes. Adjust seasoning with salt and pepper. Cook for 10 minutes or until the sauce has thickened slightly. 4. Add the peas, increase heat to medium and cook for 3 minutes. Stir in the reserved chourico and pancetta and cook for another 3 minutes. 5. 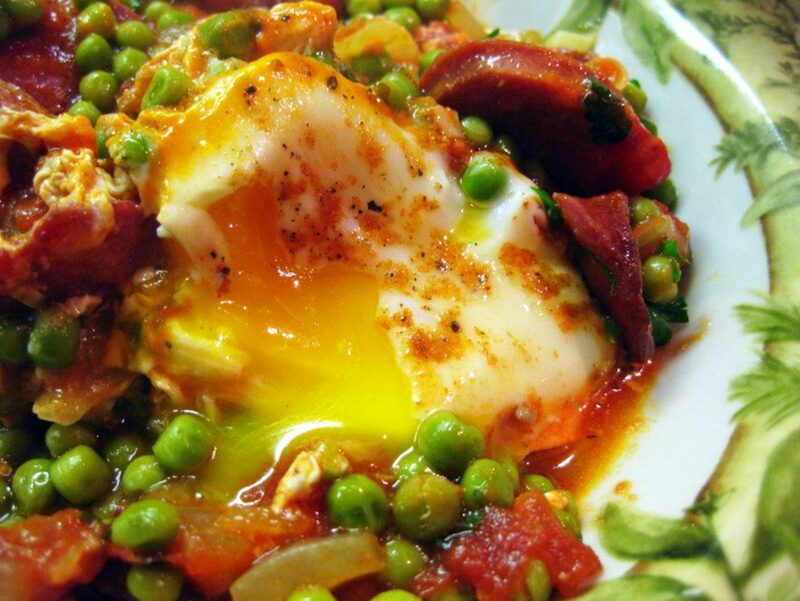 Carefully break 6 eggs into the peas (the eggs will sink into the peas slightly). Season the eggs with salt and pepper. Sprinkle a little sweet paprika over each egg yolk. 6. Cover and cook until the eggs are done to your liking; 6-7 minutes for runny eggs and 8-9 for fully cooked. Remove bay leaves. 7. Sprinkle with remaining parsley and drizzle with a little olive oil. Serve with some crusty bread to sop up all the sauce. Looks good, didn't know there was a difference between chorizo and chouriço.